I often get requests for Pinterest rainbow cakes. The hardest part is explaining why colored cake, while pretty, doesn’t taste as good as normal cake. It takes a LOT of color to dye that batter. That dye changes the taste of the cake and sometimes those colors aren’t nearly as vibrant as the images they have saved. I always suggest saving the color for the frosting. This cake is one where we did just that! 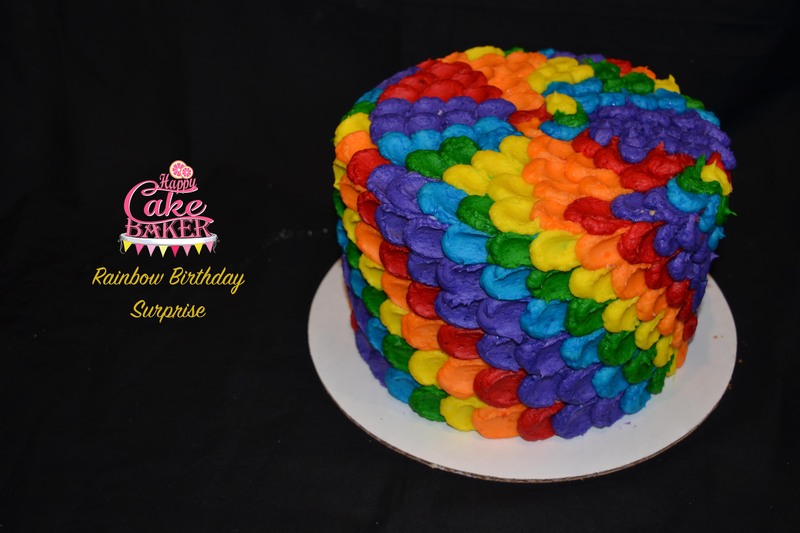 We even opted to rainbow the frosting between the cake layers for a more fun look. I love this cake. the baby’s birthday party is oct 23rd. how far in advance do you need to make a cake. how much would this cake be, too. adorable! thank you, susan rummells also, are you in iowa city or close? Thank you for your interest!! The best way to contact me for a cake is at Happycakebaker@gmail.com .